So someone you know is turning 50, and you want to know just what you can do to make this a special and memorable occasion. It is not every day that something like this happens, and so it might be a good excuse to pull out all the stops and truly make this particular party one that everyone in attendance will remember for years to come. To give you a little bit of insight into what you can do to get yourself started, you should consider a few of these fun ideas for 50th birthday party. One thing that is almost always successful is a decade themed party. If the person turning 50 knows that they have a party coming, talk to them about the best era of their life. When the music was the best, when they were really out on the prowl and in the prime of their life. When you have the decade that was deemed to be the favorite, theme an entire party around that decade. Play songs from that era, dress like people did then and talk with the same vernacular. If you can get all of the guests to join in, it will be a party that no one will forget any time soon for all the right reasons. Another thing that you might consider, instead of the traditional “over the hill” jokes that tend to plague parties with ugly black balloons and depressing talks of how the birthday guy or gal is past their prime, consider throwing an “Other Side of The Mountain” party. This can be done in one of two ways, depending on the adventurous nature of the guest of honor. If they love the outdoors, then have their birthday party outside on a big camping trip complete with all of the people they know and love. While everyone might not stay the night, most people will at least come spend the afternoon and evening sharing in the celebration. The alternative is setting up camp inside the place where the party is, but just more for decoration then. If you are just looking for fun ideas in general, here is an icebreaker that will work at any of the above-mentioned party ideas or anything that you might have planned. Take pieces of paper with famous/infamous people written on them. Try to add only the kind of names that the bulk of the attendees will know, and as guests come in attach one of these names to their back. Encourage them to figure out who they are by interacting with other guests and asking questions that are only able to be answered with yes and no. This will get people talking and sharing with one another, and can help keep people engaged until the typical birthday events begin. 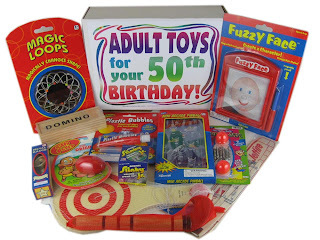 So if you wanted fun ideas for 50th birthday party, hopefully this was able to help you out. Of course there are other things to consider and other themes that you could select, but these options listed above are solid approaches for memorable parties for the person you care about.